Nikolai is going on a field trip today with the entire third grade from his school. He told me that there might be alligators or crocodiles which he might get a chance to pet! I forgot which one he said though, but I managed to find a crocodile cookie cutter from my animal pals cookie cutter set and hope this lunch will surprise him. Among our many lunchboxes, I believe the Trudeau Fuel box is the best to send for his field trips since the lid is attached to the box. He told me that he did not get to sit during his previous field trip since the benches were limited and I thought that it would be nice to have a convenient lunch box this time just in case. Crocodile shaped sandwich with icing eyes and nori accents (free hand cut). Granola bar and a mozzarella string cheese. A large strawberry cut into flower shape above some seedless red grapes in a square silicone cup. Cucumber slices in a square silicone cup. This lunch is packed in a Trudeau Fuel sandwich box. 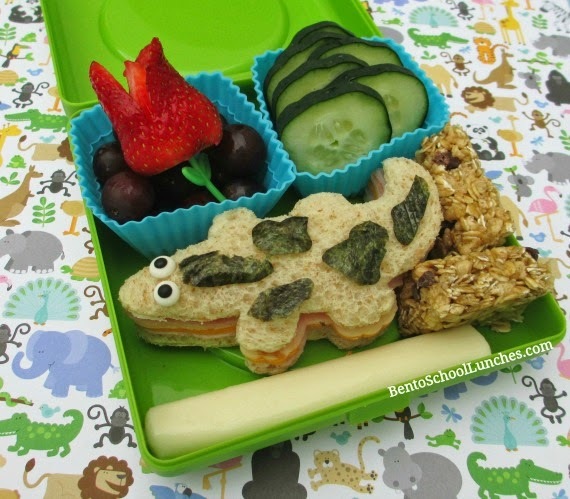 Cute croc and a delish lunch! I love this lunch! So cute!! Very cute crocodile! Hope he enjoyed himself! Cutie crocodile! Sounds like it will be a fun trip!